Deluxe Vinyl Kettlebells are known for its efficient and exciting workouts. Also working with this colorful kettlebell is really a fun. You can enjoy this effective workout session. This kettlebell workout increases your muscle strength and power. The stamina of your body will also rise, and you can burn lots of calories at the same time. The handle of this kettlebell is wide and authentic that provides you the required comfort and grip. The total product is coated with long lasting vinyl that prevents your floor from damage. 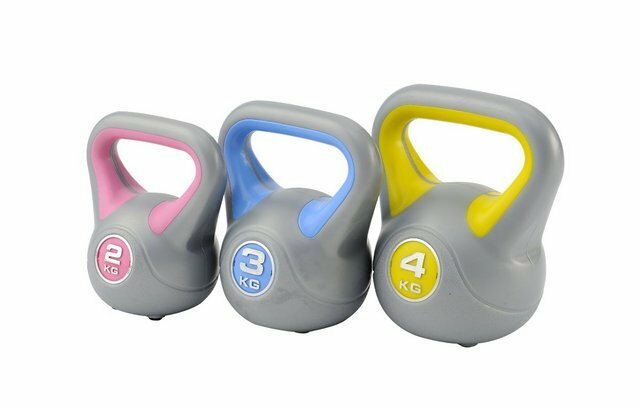 Deluxe Vinyl Kettlebells are color coded by weight. The weight and color code are as follows: Blue for 18 pounds, Fuchsia for 12 pounds, Green for 25 pounds, Grey for 40 pounds, Grey/Purple for 45 Pounds, Light Blue for 50 Pounds, Moss Green for 30 Pounds, Orange for 8 Pounds, Purple for 15 pounds, Red for 10 Pounds, Taupe for 35 Pounds, Teal for 20 Pounds, and Yellow for 5 Pounds. The Deluxe Vinyl Kettlebells are used for jerks, throws, squats, and cleans, and snatches and rotational swings. The fully vinyl coated product offers you comfort and at the same time protect your floor. It is an ideal fitness training tool for both personal as well as group training. Bent Over: Reverse Fly: Effective on your abdominal muscles. It keeps them tight and increases their strength. Also, effective on arms and legs. Front Lunge: Arm Swing: It strengthens the muscles of shoulders, arms, abdomens, and legs. Back Lunge: Shoulder Press: Effective on your shoulder and arms. Increases the power of your muscles. Squat Row: Increases the stamina and power of your total muscles. Squat Arm Swing: It is also an exercise that is effective on your shoulder and arms. Deadlift Upright low: Builds the muscles of your whole body. Kettlebell training is considered as the best fitness training because it joins cardio and strength training in one package. Weight training with cardio benefit is a rare combination that can be found here, and it effective minimizes your gym time since it works fast. kettlebells works on your whole body at a time. Hence it is a better option than dumbbells and barbells. This workout allows you to lose your unwanted body fats quickly and efficiently. You can even lose 1200 calories per hour using this training. This is because here you are using multiple muscles at one time. Kettlebell trainings are very intense. Hence it cannot be a suitable option for novice persons who are new to weight training and general exercises. However, they can also use this measure with the help of a good professional trainer. While you buy kettlebells it is important to check the security measures as improper training and low quality product may injure you. You can also buy kettlebells online and avail some hefty discounts on them.